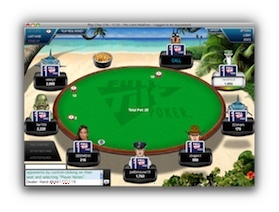 Full Tilt Poker - Play Where The Pro's Play! Full Tilt Poker is a service designed for and meant to cater toward the very best and most talented players of the poker world. With professional members including Phil Ivey and Allen Cunningham it’s clear that Full Tilt Poker has the support of upper echelon players but what is most impressive is that the site manages not to alienate newcomers in the process. The real draw of Full Tilt Poker is the size of bets and fierce competition offered for players of ample experience and with the pocketbooks to finance high-stakes tables. Although the site does do a commendable job of providing play for those just jumping into the game of poker it is fairly clear to see that Full Tilt Poker is meant for poker players who are serious about the practice. The poker tournaments offered via the site are always enormous, having the history of being some of the largest available since Full Tilt's 2004 founding and it’s not unusual for Team Full Tilt's Poker professionals to appear at the tables. Aside from the financial incentives of these games the site also offers a good deal of events which allow players to vie for entry into the World Series of Poker and otherwise gain attention as a solid poker contender if they’re quickly climbing the ranks. The standard loyalty programs are in place at Full Tilt Poker as well and offer the exchange of frequent-player points for the company’s merchandise along with other typical incentives. There are smaller games provided for players who are just starting out and Full Tilt Poker does make a good effort toward inexperienced gamblers. Tutorials and FAQs regarding strategy and basic guidelines are all presented on the site in an effort to prevent skewing the demographic too far in favour of skilled members. The lack of a fully online mode is a bit of a drawback considering how many other Internet poker sites (and even casinos) allow for games to be both downloaded and streamed from the site itself rather than forcing the latter option. 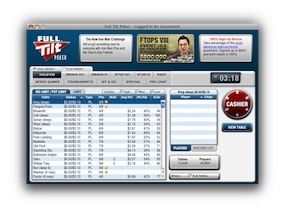 Full Tilt Poker requires the free software to be run from the player’s computer which means that interested gamblers are going to have to set-up and install the client just to get a sample of how the site stacks up. Luckily most of those who take the plunge into the Full Tilt Poker software aren’t likely to come away disappointed. The graphics and options of the table are among the best available within the world of online poker and there are even a few extra features included which aren’t found on many other sites. Since the action was designed with serious players in mind, multi-table viewing and data collection were obviously given their share of attention during development. There are convenient and easily found options for taking notes on other players as well as the ability to set up automatic tournament and ring-game information to Poker Tracker. The software also runs on Mac computers which is a bonus for this often ignored segment of operating systems. Security and support are excellent at Full Tilt Poker which is essential given the elite clientele that the service seeks to provide a poker destination for. Encryption and help software are top of the line and fully capable of ensuring that the site’s members have quick answers to their questions and safe play. Full Tilt Poker ultimately comes away as an online poker room that does it’s best to cover a wide range of skill sets but will perhaps always be known as the premier destination for high-stakes players. Although it is not a bad choice for anyone seeking out a solid online poker service Full Tilt Poker is best suited for betters poker players who want to take on the big leagues. 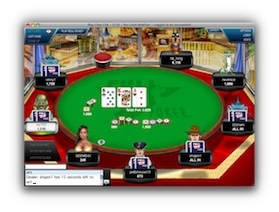 Full Tilt Poker is a download only client but it does offer a download client for both Windows and MAC OSX. So, the ever growing Mac user base can sign up and play at Full Tilt Poker without any software issues or having to run Full Tilt Poker on a virtual Windows machine. We have tested both the Windows and Mac OS X versions of the Full Tilt Poker software and can report that they are both very responsive and look very professional, all adding to the game experience at Full Tilt Poker. 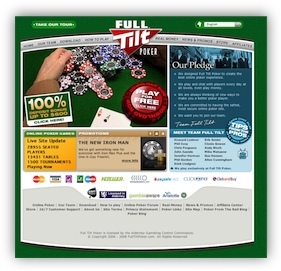 Full Tilt Poker offer 24/7 customer support for all aspects of support that you may require. One thing that they do not offer is telephone support, but you can email them at [email protected] and they respond very fast. We put this to the test here at Findabet.co.k and we got an answer to our issue within 20 minutes. There is also the facility to do onlice chat within the Poker Client, direct to a support representatice from Full Tilt Poker. The following deposit and withdrawal options are avalable at Full Tilt Poker.